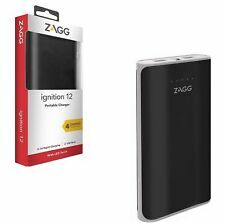 ZAGG Ignition 12,000mAh Dual USB Universal Power Bank. Easy to use and carry - portable, compact and sleek design. Built in short circuit protection. Airline safe - carry on as hand baggage. Allowed through airport security. The small, compact design fits in any bag, so you will never be caught empty again. The LED indicator hows exactly how much power the Ignition 12 has left. LED indicator for remaining battery.